Almost enough to tempt me into finally buying an XBox One X (+ the fact I have around 70+ 360 games lying around, about half of which are also by now back-compat). Any word as to whether the FFXIII games all have their DLC also available in back-compat on the XBox One X? I believe it's standard for all BC games to have DLC made BC also. Photek wrote: I believe it's standard for all BC games to have DLC made BC also. So now it's tricky. The moment I buy an XBox One X to play FFXIII in glorious 4K on a console is the exact moment Square announce a re-release of all three games in the FFXIII trilogy in HD for PS4 (with Pro enhancements). I can almost write the script for muggins here if I'm not careful. I'm going to wait and see how this goes. 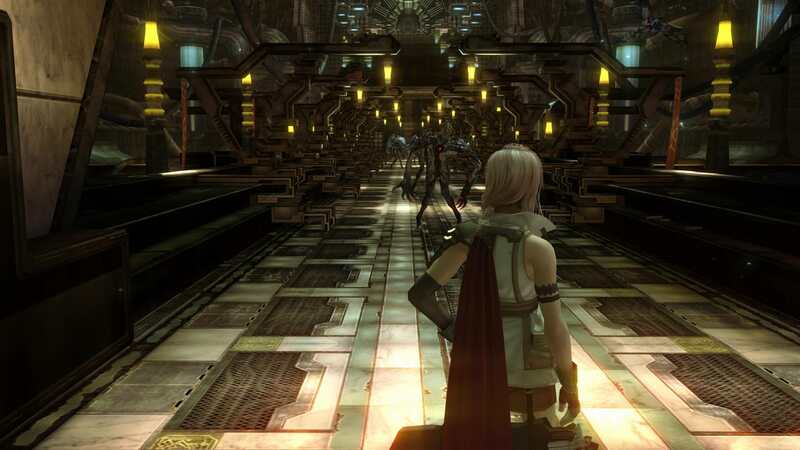 Next year is the 10th anniversary of FFXIII. I don't think that's going to happen, I can't think of a single back compat game that has had a remaster come out on anything after it was released on X1, also, it's MS who did the heavy lifting here, bar getting video files, Square did nothing. Photek wrote: I don't think that's going to happen, I can't think of a single back compat game that has had a remaster come out on anything after it was released on X1, also, it's MS who did the heavy lifting here, bar getting video files, Square did nothing. You could be right, but from Square's point-of-view, we know they like their Anniversary celebrations and FFXIII was (I'm pretty sure) their best-selling FF title. A 10th Anniversary Enhanced Edition of all three games on PS4 is money on the table for them. Maybe they're going to wait and see what the take-up rate for the X1 back-compat versions is and decide, based on that, if next year they'll push the boat out on a PS4 re-release, too. The critical reception has been very positive for the X1 version. It's encouraging. Cal wrote: The critical reception has been very positive for the X1 version. It's encouraging. I think most of that reception is the lengths they went to, to get it to look that good and the fact that it comes at no extra cost and more over, the entire trilogy is on sale digitally at mo. I'm using my existing XIII disc to play and I already picked up XIII-2 years ago to play but never got around to it, it's great that I can use them at zero cost for 4K versions. Wonder if the Mass Effect trilogy will get this sort of X enhancement? And, on a Mass Effect note, does the DLC ever go on sale? Already have the ME2 DLC, but will get the ME3 DLC for when I want to play it enhanced. I've been toying with picking up an X (probably Black Friday 2019) for when I upgrade to a 4K TV. The only thing putting me off is assuming the nextbox will do the same and more. Osito wrote: I've been toying with picking up an X (probably Black Friday 2019) for when I upgrade to a 4K TV. The only thing putting me off is assuming the nextbox will do the same and more. With the BC XBLA games, I take it games like , Teenage Muqnt Ninja Turtles 1989, The Simpson’s Arcade game and Scott Pilgrim vs The World will never be made available? I was going to buy FFXIII then realised I own it on Steam, so installed from there..
Hmm that's a nice unexpected selection, well, barring Sonic Unleashed. AvP wasn't too bad, didn't expect to see Amalur come out though - might grab that as remember enjoying what I played of it. Though guess it might end up on Ea Access in the not too distant future. The Bureau's not bad. I might re-buy The Darkness. It's fantastic, but I traded it in after completing it. It's only £2.99 at the moment - worth it for Mike Patton. Split/Second is finally the game it always intended to be back on 360, but simply aimed too high at the time, given the platform's inherent restrictions. On XB1X it is transformed - gone are the troublesome frame rates and the picture quality - complete with bombastic pyrotechnics and an insane sense of speed - is almost certainly one of the best examples I've yet seen of how the XB1X can lift a 360 game from its knees and finally let it shine. Ghost Recon Future Soldier looks amazing from the moment you start the SP campaign on XB1X. Again, the frame rate is silky smooth and the colours, textures and FX all pop out of the screen. Dirt 3 is another 360 game that boasts a significantly improved image quality and frame rate and approaches PC-levels of detail on the XB1X. Just a shame it looks like we won't be getting Dirt 2 on back-compat any time soon (it's actually my favourite of the DiRT series). So those are just a few - but I could really pick out any one of the 360 games I've so far tested on XB1X and improvements would be obvious and noteworthy to them all. Kingdoms of Amalur: Reckoning looks impressive from what I've seen of the back-compat version on some YT vids. Next on my list, I think. I keep meaning to get my 360 games out of storage and give this whole backwards campatibility thing a go but game pass has me stocked with games already. I really cant believe what a turnaround Microsoft have managed during this generation, I went from not wanting to touch an Xbox again after that reveal to being genuinely excited to see what theyre going to announce next. I completely understand people using the Xbox One (and X1X) for back compat, the very minimum thing it does is fix frame rates but it also removes all tearing as standard. The X1X Enhanced back compat games are remasters in all but name and I hope they expand that process specifically. The fact that it's all at no additional cost is big plus. Thats it for the rest of the year folks.